On New Year's Day during the Red Eye 50k I trip on a rock and collapse forward, landing flat with a thump! This Sunday, descending the steep Massanutten Mountain Waterfall Trail I slip on the leaves and with another loud thump! find myself suddenly flat on my back. My pair of stumbles, fore and aft, brings to mind the Nurse's bawdy lines in Act I Scene iii of Romeo and Juliet describing events from Juliet's infancy. As a toddler Juliet takes a tumble and gets a goose egg on her forehead. The Nurse's husband comforts the baby: "... dost thou fall upon thy face? 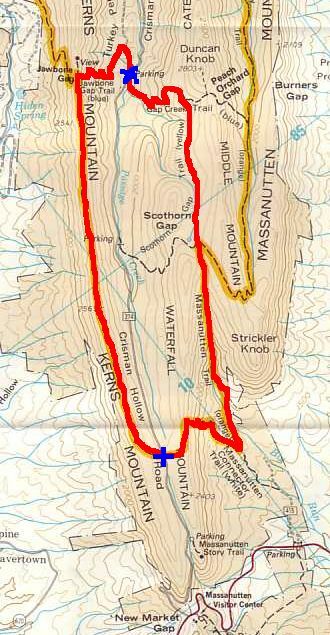 Thou wilt fall backward when thou hast more wit ..."
The red line shows our counter-clockwise route: Caren Jew and I begin the expedition at the blue "X" at the top of the map and climb ~500 feet to the ridge on the west that forms Kerns Mountain. Then we go south along the Massanutten Trail and descend back to Crisman Hollow Rd at the blue "+" where Quatro Hubbard's aid station helps us refuel. (Quatro tells me that he has looked at my DC Boundary Stone web pages, as part of his work as Archivist for the Virginia Department of Historic Resources. One meets fans in the strangest places!) We descend steeply another ~500 feet on the old Waterfall Mountain segment of the Massanutten Trail, turn north, then climb back to our starting point via Scothorn Gap Trail and Gap Creek Trail. How did we get here, trekking across snow and rocks with temperatures in the teens? As usual, Caren swindles me into it! I get up at 3am and meet her a bit after 5 at the Davis Library. 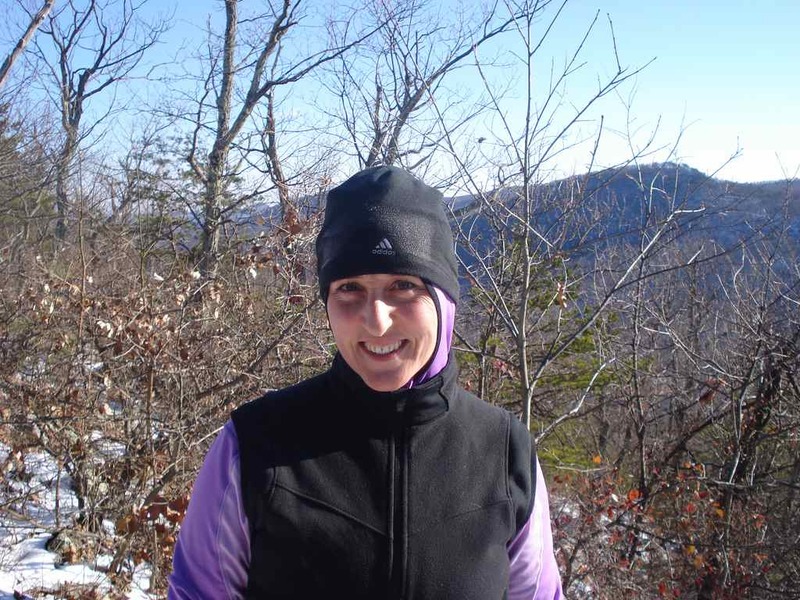 She drives the two-plus hours to the southern end of Massanutten Mountain where today's G2G = "Gap to Gap" VHTRC training run is scheduled to begin. Along the way we listen to a CD I've made of running songs and bob our heads to the beat of ZZ Top, David Bowie, Blues Traveler, and other classic rock. A yellow-tinged gibbous moon sets in the west; Venus rises over the mountains to our the east. 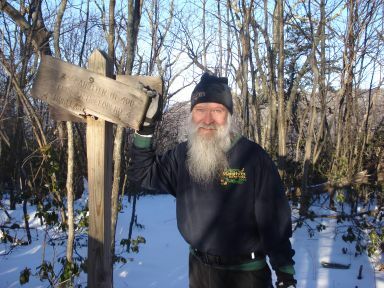 At the McDonalds just off I-81 in New Market we pause to visit the facilities and discover more than half a dozen other trail runners similarly preparing for a frigid winter morning. Nerve-wracking drive past a spun-out Mustang blocking half of a slick, icy, mountain road. Doesn't help that there's five SUVs behind me that would have no trouble whatsoever. We find out later Michelle Price and gang can't make it past the Mustang and she and several other cars have to reverse and start elsewhere. Temps in the teens and lots of wind. Nice runnable trail into the 6-mile aid station, and elsewhere on the trail. Surprisingly, the snow made the trail less technical, although it was more work to run through. Tanked big-time going up yet another climb. Mark doesn't know how bad I want to quit and saves the day by sharing his gel and dislodging my frozen water bottle. A safe drive out. Did I say how freaked out I was driving in? suggested that we do this in the first place. spurned the chance to jog back along Crisman Hollow Road and avoid almost half a dozen tough miles. was the one who saw the signs marking the transitions from Massanutten Trail to the other trails in the loop, so we didn't wander aimlessly in the woods. My diagnosis of the problems that we both experience today: dehydration brought on by exertion in the cold dry air. When I get home I weigh myself and find that I've lost more than half a pound compared to this morning --- and that's after our stop at a fast food restaurant on the way back where I inhale veggie burger, fries, and soda water. Actual dehydration was thus probably over 2 lbs. for me. Overall the Massanutten experience is an excellent one: daunting hills and bitter cold add to the terrain's beauty. Crows scold us for intruding on their turf. Icicles grow on my moustache and beard as our water bottles freeze. And we survive!